Another from the set of artworks for fantasy Yule cards. I love this dragon! He (?) is soooo beautiful! Your gorgeous drawings accompany (right word?) myself for years! Such supreme quality, beautiful work. and so do you my friend You're amazing! Hah, I still have one of these from the yule cards set I ordered years ago. Are those fruits his food or his gift? I LOVE IT, it has so much detail to it B-E-Autiful!!!!!!! Wow, I found this card in a small shop in Tahiti! Snow and Dragon?! I love this! This would be EPIC as a christmas calendar picture! WOW!! what program do you use?! 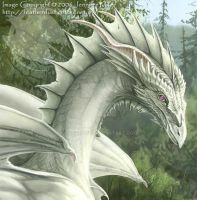 One of my all time favorite books is Dragonriders of Pern, when i was still able to draw I did some illustrations for some of the dragons mentioned in the story, one special one was the white baby dragon named Ruth. This reminded me of that, thanks for that and this portrait is beautiful beyond words you have a special gift for sure. I don't know how you can draw and paint like this, but your artwork ROCKS! It's very beautiful.......does it have a name? Hi! I wanted to ask if I could upload this as the cover for my story on fanfiction. Thanks! A beautiful image Anne, I really admire your work and can't wait to show my daughter. I've been tryign to figure out how to do that wing position. Another lovely one. Just noticed the name on your images - I come across your artwork all the time! Its fantastic! I have a recommendation you could put two dragons, one female one male, under holly and mistletoe. Wow, okay i have a lot to work for if i ever want to become a professional artist. I'm simply amazed at how you can bring out such detail in your works; that is what brought me to join Deviant Art so that i could possibly learn more about how to draw and write better. What a fantastic idea for a Christmas card! Hi, Happy New Year, I wanted to let you know that I featured this deviation in my journal. whoa, beautiful. I really appriciate your art. Just too cute and perfect for the wintery holiday season! Love it!